SPARKS, Nev. --- Sierra Nevada Corporation's (SNC) Dream Chaser spacecraft passed a key milestone for NASA'S Commercial Resupply Services 2 (CRS-2) contract, validating design performance and clearing the way for full spacecraft production. 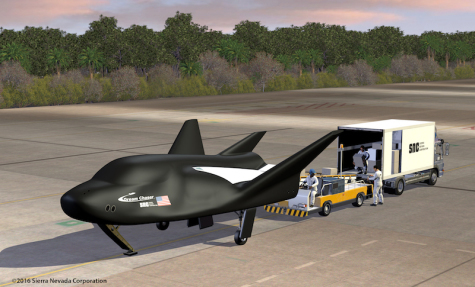 The milestone marks completion of Integration Review 4 (IR4) demonstrating NASA's confidence in the safety and maturity of Dream Chaser's design. "NASA's acknowledgement that SNC has completed this critical milestone and its approval of full production of the first Dream Chaser spacecraft is a major indication we are on the right path toward increasing vital science return for the industry," said John Curry, program director for CRS-2 under SNC's Space Systems business area. Many critical parts of the orbital vehicle are already complete, built and being tested, including major structural components, thermal protection system tiles and avionics hardware. With the success of IR4, these components are now being integrated into the orbital vehicle assembly at SNC's Space Systems facilities in Louisville, CO.
SNC's Dream Chaser spacecraft is slated to service the International Space Station as early as late 2020. Production includes both the uncrewed Dream Chaser winged vehicle and the cargo module, which remains attached to the winged vehicle during orbital operations. "We are one step closer to the Dream Chaser spacecraft's first orbital flight. This comprehensive review approved moving the Dream Chaser program into the production phase so we can get Dream Chaser to market as a critical space station resupply spacecraft as soon as possible," said Fatih Ozmen, co-owner and CEO of SNC. "IR4 was a series of reviews, documentation, and data deliverables that are the culmination of many years of design work, analysis and development testing." The Dream Chaser will perform at least six missions to provide cargo resupply, disposal and return services to the International Space Station under NASA's CRS-2 contract. The spacecraft delivers up to 5,500kg (~12,100 lbs.) of pressurized and unpressurized cargo and returns over 1,850 kg (~4,000 lbs.) of cargo with a gentle runway landing. The spacecraft also provides approximately 3,400kg (~7,400 lbs.) of disposal capability each mission via the cargo module, which burns up in the atmosphere after separation from the Dream Chaser winged vehicle. Owned and operated by SNC, the Dream Chaser spacecraft is a reusable, multi-mission space utility vehicle. It is capable of transportation services to and from low-Earth orbit, where the International Space Station resides, and is the only commercial, lifting-body vehicle capable of a runway landing. The Dream Chaser Cargo System was selected by NASA to provide cargo delivery and disposal services to the space station under the Commercial Resupply Services 2 (CRS-2) contract. All Dream Chaser CRS-2 cargo missions are planned to land at Kennedy Space Center's Shuttle Landing Facility. Sierra Nevada Corporation (SNC) is a leader in solving the world's toughest challenges through advanced engineering technologies in Space Systems, Commercial Solutions, and National Security and Defense. SNC's Space Systems business area designs and manufactures advanced spacecraft and satellite solutions, space habitats and environmental systems, propulsion systems, precision space mechanisms and subsystems, and SNC's Dream Chaser spacecraft.